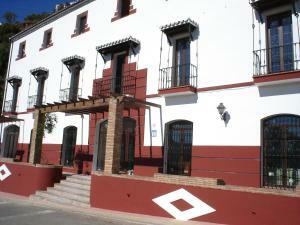 Here you will find a selection of hotels located in the numerous villages of Andalucia. Thanks to their location, guests at these hotels can enjoy strolls around traditional Andalusian streets, surrounded by quaint and well decorated homes typical of pueblos blancos (white villages). While the size of these hotels may be smaller than those found in larger towns and cities, village hotels will still offer basic amenities and services like any other accommodation, except in a traditional and more rural Andalusian environment. In this sense, village hotels are a good choice for nature lovers and those who enjoy activities such as cycling and walking, as well as visiting historical and culturally significant places. The village hotels below are selected from one of our affiliate partners. Located in the middle of a small village, this boutique hotel has lots of character. You can soak up the Spanish sun on the roof terrace and refresh yourself in the paddling pool. Experience authentic Andalusia in the remote white village of Cartajima. In the heart of Medieval Vejer de la Frontera, Hotel La Casa del Califa features a rooftop bar-terrace with beautiful views. Unique facilities include a map room and an award-winning restaurant. 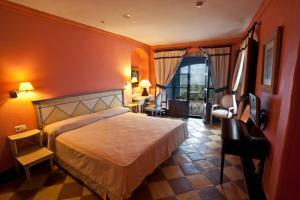 Accessed by stairs, each room at the La Casa del Califa hotel is decorated in a different style. 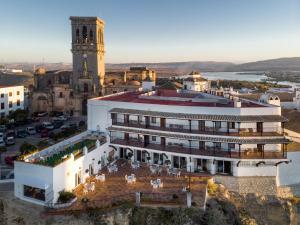 Located in the Andalusian hilltop town of Arcos de la Frontera, this charming hotel offers fantastic views. It offers a sun terrace and air-conditioned rooms with a TV and private bathroom. The rooms at La Casa Grande feature Moorish-inspired décor, with ornate rugs and lamps. Boasting impressive views over the fertile plains below the Andalusian town of Arcos de la Frontera, this Parador hotel is perfect for relaxation in this charming, white-washed town. The hotel is a short stroll from the castle and the town hall. From here you can also easily get to the other famous white-washed villages in this area of Andalusia. Featuring an outdoor swimming pool, Hotel Bandolero is a charming boutique hotel with an on-site restaurant and bar. It is located at the entrance of the tiny Andalusian village of Júzcar, known for being the world's first 'Smurf Town' after every single building in the town was painted blue to celebrate the premiere of the world-renowned film - The Smurfs 3D. Posada Mirador de Jubrique is on the main street in the centre of Jubrique. The pleasant simple hotel is an ideal base to visit the Genal villages. Large guest lounge and dining room. It offers free Wi-Fi and a front terrace. Seven first floor rooms have small balcony. All 14 rooms have views over Genal Valley. Located in a renovated home, formerly known as Doctor Don Juan Marina’s house, Casa Henrietta offers elegant accommodation with views of the countryside. All rooms at Casa Henrietta feature an elegant rustic-style décor with tiled floors, brightly-painted walls and antique furnishings. Each includes a private bathroom with a bathtub or shower. Located in the centre of Jimena de la Frontera, one of Andalusia’s famous “Pueblos Blancos”, this charming property has a swimming pool. 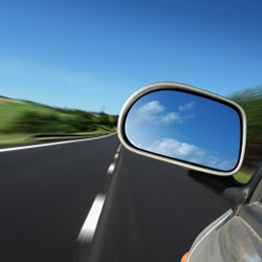 The attractive rooms have air conditioning and private bathrooms. The Hostel el Anon has a café and restaurant. There you can enjoy classic, home-cooked Andalusia dishes.